I did it! I blogged every single day for the month of June. When I started this blogathon my intentions were to write a tip a day sharing tricks and techniques for those of you who want more time, more freedom, and more delight in your day. I got a little distracted by all that was happening in the US Supreme Court and my life. It’s been an interested month! Our last assignment for the blogathon was to create a Word Cloud. 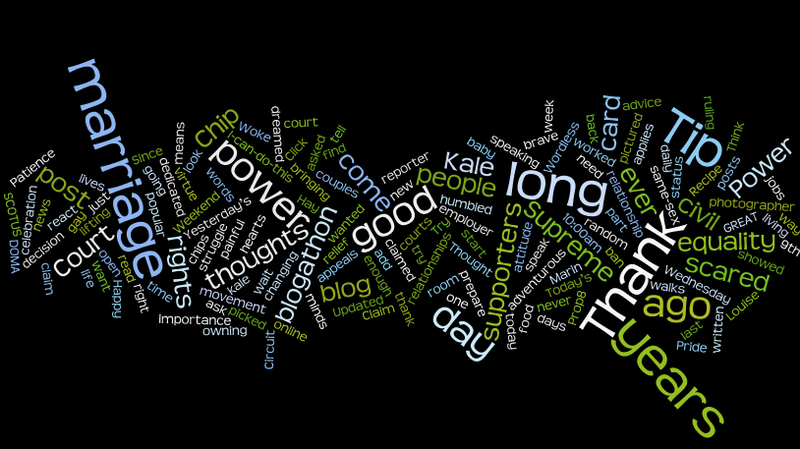 A word cloud sums up the common words/themes used. As you can see my attention was focused on marriage equality this month. Congratulations to everyone who completed the WordCount Blogathon 2013 Challenge! Thank you Michelle Rafter for hosting this blogathon!